Your credit score has nothing to do with your age, gender or career. Yet nearly 60% of those who responded to a recent survey believe that employment history is a factor to nudging up a credit score. Another 39% of 1,006 people asked by Visa Inc. thought age played a role, while more than one fifth of people surveyed believed that the ability to speak English and national origin were factors. Loan applications, which do ask personal background questions about date of birth and gender, are invariably linked to credit reports in consumers' minds because they are often used together by lenders to make a decision. This is entirely separate from the information used to build a credit score, which instead relies on transactional information about how a borrower has managed his or her bills and credit lines. A good or bad credit score plays a major role in financial, housing and employment opportunities but less than half of Americans regularly check their score, the Visa survey reported. Americans are entitled to a free report from each of three national agencies at AnnualCreditReport.com. Remember that there is no one score; all three credit reporting agencies may use different scoring formulas, including popular ones such as FICO and VantageScore, and it is advisable to get all three reports. There are five basic components that credit rating companies use to determine a score, and each piece is given a different approximate weight, according to Atlanta-based non-profit credit counseling group, CredAbility. 1. Payment history makes up 35% of a credit score. This includes the overall record of payment to all lenders and billing organizations. The occasional late payment on a bill will derail a credit score, but credit companies do consider the overall history of paying bills on time. 2. Total amount owed and debt-to-income ratio account for 30%. Lenders and credit companies look at the total number of accounts, credit limit and how much of a credit line is being used. If lenders see high balances across multiple accounts, they may view that as a signal that a borrower is overextended. They also look at how much is owed on installment loans. 3. Credit history length makes up another 15%. In general, the longer a borrower has used credit responsibly the higher the credit rating. However, new borrowers with only one or two well-managed traditional accounts can still have a high score. 4. Opening new lines of credit can affect 10%. 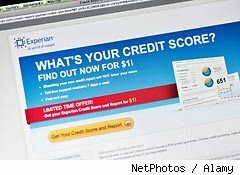 Credit score companies consider how many new accounts a borrower is applying. Opening several credit accounts in a short period of time represents a higher risk, especially for people without long established credit histories. 5. The mix of credit types makes up 10%. Credit types can range from a mortgage, to auto loans and other installment loans, retail accounts and finance company accounts. Responsible management of loans is more important than types of credit. "Paying bills on time is the number one thing [consumers can do] to reshape credit," says Mechel Glass, CredAbility's director of education. "Limit the credit you are trying to go after and take the time to improve credit before trying to get a loan."